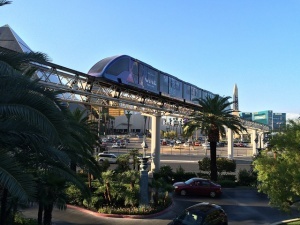 A free tram runs between the Excalibur, the Luxor and Mandalay Bay hotels. All southbound trams run non-stop from the Excalibur to Mandalay Bay. The tram that runs on track closest to the resorts stop at Luxor in northbound directions only. The tram that runs on the outer track run non-stop northbound from Mandalay Bay to Excalibur. Trams run daily from 9am to about 12:10am (Sun-Wed) 2:30am (Thu-Sat). This page was last edited on 29 October 2018, at 12:47.